Some of the gutter services in Montgomery County Maryland that we provide include gutter cleaning, gutter repairs, gutter guards and installations. No matter what type of gutter services you need done, we can help you. Just Contact our office at 301-216-9675. We are fully licensed, bonded and insured to protect your home and our employees for all of the rain gutter services we provide. When you hire a company in Maryland for gutter services, make sure that they have a Maryland Home Improvement License, which is required by law. We can help you prevent damages to your home and keep your family safe! When you hire Henrys Housework for your gutter services, a trained employee will arrive on schedule to clean your gutters, your downspouts, tighten loose gutter nails, and inspect your roof for over 50 common repair problems! 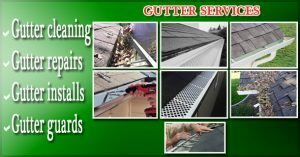 We also provide gutter cleaning contracts that keep you from having to remember when it is time to clean your gutters or other gutter services. You can save money on every gutter cleaning and other services! Our gutter repair services include repairing gutters made from aluminum, steel, copper and any style of gutters including K style and half round gutters. We also offer gutter re-pitching, gutter sealing, downspout repairs and many other types of repairs as part of our standard gutter services in Maryland. Click here: for more information on gutter guard installations.